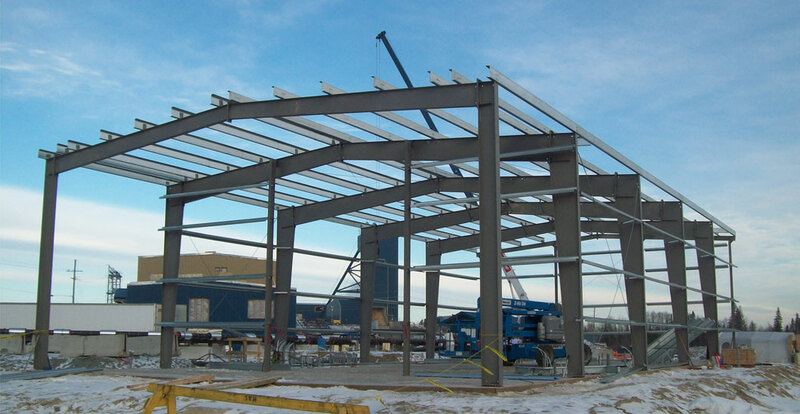 Our Contracting Projects - SWM Contracting Inc.
Assay Lab Structural portion of Pre Engineered Builing. Civil portion of Assay Lab. Roofing and Wall Cladding of Pre Engineered Building. Concrete foundation after forms have been removed. Near completion just clean up remaining. SWM Contracting was contracted by Lakeshore Gold for the fabrication and installation of their on-site scale pad.� SWM was responsible for all steps of the project from site prep through to completion. This project consisted of all Civil work, supply and erection of a Pre Engineered Behlen Building 50’ x 100’, the project was a turnkey project, the concrete floor had to be tapered to ensure all water, snow and ice that melted ran into the sump in the center. After the fire SWM was contracted to Supply and Erect the following buildings, there was a tight deadline to meet, as well as had to work in and around Mill Machinery that was not being replaced, and coordinate the new machinery coming in. Installation of wave feeder, modification of existing live deck, relocated and modified existing chain conveyors, installation of debarker, modified and relocated existing belt conveyors. In December 2004, we completed a 1-year $2 million dollar project focusing on the installation and testing of nine turbines, complete with generators. SWM was responsible for all labour, equipment, supervision, and field management for this project. Flow Meter and Actuated Valve Header installation. 2� and 3� run along existing piping. 3� line running amongst existing piping. Showing challenges of laying out pipe to get around existing structure, 3� line continuation from picture above. Picture of wall penetration 3� line going out to tanks outside. Same 3� line from inside penetration from outside going to tanks. Several hundred fittings i.e. 90deg, 45deg, tees etc. All of the piping and fittings were degreased for oxygen service in house re packaged and shipped to site for installation. Please see pictures below of the different lines in a couple locations. SWM was responsible for the fabrication and installation of a Millbank cable bridge, and associated steel work, concrete saw cutting, and civil work. SWM was responsible for the supply, fabrication, and installation of the mechanical, piping and HVAC work. SWM Contracting was hired to undertake all elements related to the construction of a Server Room for Ganotec's Operations and Maintenance building. This consisted erecting metal studs, dry walling, tape mud and paint, installing doors and flooring as well as plumbing, HVAC and electrical. Dismantling part of the stack. Shop fabricate, supply, inspect, test, and delivery and erection of the complete top part of the dryer stack. Supply and install new top part of stack including new ladders, platforms, stainless steel top and strakers. Shop paint total fabrication and touch-up field welds. Dismantle all existing Electrical, Instrumentation, and Piping components associated with the original stack to the cut elevation and reinstall as per the original design. Locate and install sufficient lifting brackets, temporary connections and stiffening devices necessary to ship, lift and install the partial stack without damages to it or other installations. This project was successful for us and for the client, it was completed on schedule, with no accidents to report. SWM Contracting renovated a single family dwelling in order to make it barrier free.� The project included interior renovations such as modifying the bathroom to make it completely wheelchair accessible along with exterior renovations including the design and construction of a wheelchair ramp. WB 146 rubber tire backhoe available front bucket and forks. Inside of the mobile welding unit. Mobile welding unit capable of on-site Plasma Cutting, Arc Air Gouging, Tig Welding, Mig Welding, and Stick in Carbon Steel, Stainless Steel and Aluminum.